The Basketball Banquet honored not only our girls and boys basketball players, but Coach Lopez. Four of our students made the trek across the valley to the CCSD Poetry Jam event. Great job! $659.39 raised to fight cancer! The National Junior Honor Society raised $659.39 to give to the Leukemia & Lymphoma Society. Way to go! 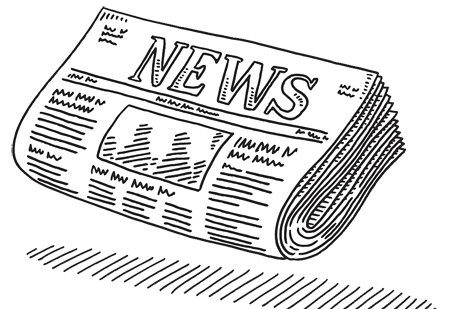 Click here to view The Woodbury Times, published in March 2019. Woodbury celebrated a fantastic Nevada Reading Week as we Found Our Superpowers by Reading! We honored this annual event from February 25 to March 1. We hosted author Laurie B. Arnold. She traveled from Washington to do an assembly for our 6th graders. In addition, there were spirit days, so students dressed for fun. The coolest theme had kids generate their superhero names and then wear them on MY NAME IS tags. We had a great turnout for our book swap which allowed students to exchange their old books for new ones. We also had Book Bingo every morning and a Mystery Game Master Contest. Some students went on a Reading Tour and read to Longhorns in other classrooms. There was also a Bookmark Contest. Our Scavenger Hunt had kids doing literacy tasks to earn tubs of Jelly Bellys. As Poetry Jam ran through the week, there was a poetry contest. You can read the winning poems below. We had a fabulous Door Decorating Contest. Roxanne Franco’s classroom won first place and the 200s hallway won the Spirit Award. We even had a Reading Plus Contest. Mr. Hager’s period 1 and 2 class won by completing 69 combos! I can not help but stop and look at the supergirl. Doesn’t she look wonderful with her bright, pink, sparkly cape on? Does it make you blush? Reading! It’s such a great thing. and use it to climb that reading tower! Mrs. G is looking for High Interest Books for her Struggling Readers. Click here to visit her new DonorsChoose page. The basketball schedule is now available on the basketball web page. Woodbury students raised $405.73 for the Salvation Army! Mrs. Carmen Franco's 6th period raised the most at $121.00. NJHS would like to thank everyone who donated! The parent survey is now available. Click here to view The Woodbury Times, published in October 2018. 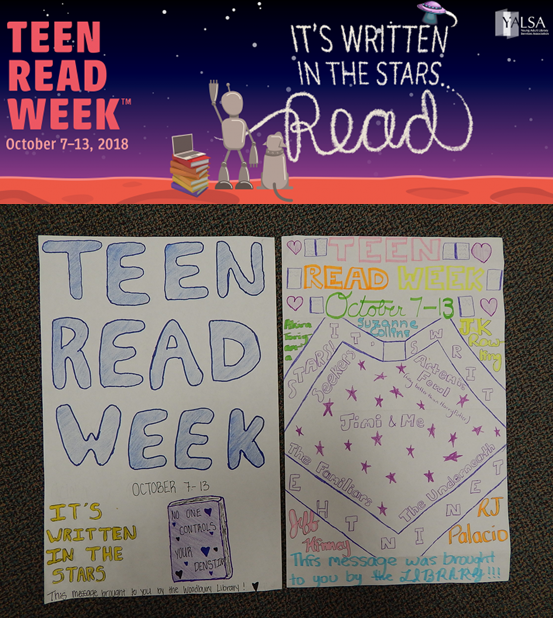 This week, we’re celebrating Teen Read Week. Come to the library and check a book out. It’s written in the stars! The Woodbury library has “a book in a jar.” Guess what book it is and you can win $25. Here are the library’s hours: Monday: 7:40 a.m. – 2:30 p.m., Tuesday: 7:40 a.m. – 2:30 p.m., Wednesday: 7:40 a.m. – 2:11 p.m., Thursday: 7:40 a.m. – 2:30 p.m., and Friday: 7:40 a.m. – 2:11 p.m. Some of Woodbury’s finest were honored at our first Student of the Month Luncheon. Students and their parents were treated to lunch and official recognition. Go Longhorns! Coffee with the Counselors is a great opportunity for parents to collaborate with the counselors and other parents to improve their child’s education. Woodbury will have Standard Student Attire for the 2018-19 school year. Visit our SSA page for details. If you have questions about SSA, you can ask them before school starts at our Back to School Kickoff. What should you do with your family over the summer? Visit our enormous list of activities. Visit this link. Here's the Woodbury Block Schedule used for testing. Click here to open the quarter three student newspaper. For Nevada Reading Week, all students took a survey about their favorite books. Want to know what Longhorns love to read? View the below documents. Thanks to Ms. Sofia for putting these lists together! Come to the library during lunch time. Yes, bring your lunch! Become a poet. If you're already a poet and you know it, share your stuff. Come for the fun of it or get ready to share your work at the regional Poetry Jam event. For this, Book Master Dwyer will drive you and other students on the Poetry Jam Van to the Whitney Library to share your work. You'll get a free book, poster, and your poetry will get published in an anthology. You will become a school hero! It's free, so do it . . . you just have to show up. For details, talk to Book Master Dwyer. Click here to view the schedule as first and second lunch take turns.